Typically, when someone thinks of oriental rugs, he or she automatically associates them with middle-eastern cultures and locations. For a variety of reasons, the most commonly known area for Oriental rug production is Persia. Persian rugs are renowned as the finest and most intricately designed rugs in the world, which gives people a reason for attributing the spiritual home of rug-making to Persia. These carpets and rugs represent a skill that very few weaving groups possess. 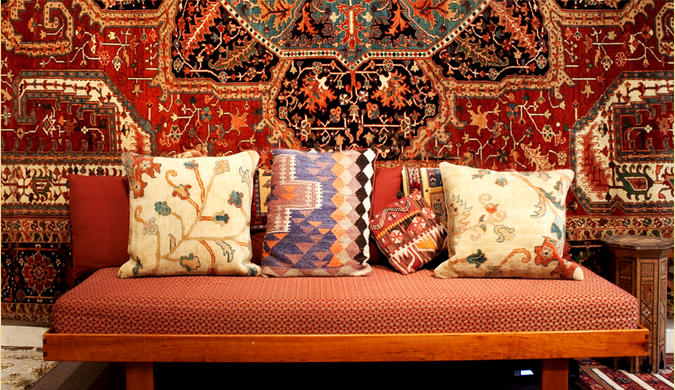 Persian rugs act as inspirational muses for weaving groups all over the world, and even Western culture has reproduced Persian designs in machine-dominated factories. The most interesting aspect of Persia’s rug weaving is its wide variety of master-weaving groups that reside in the country. Of these many master-weaving groups’ creations is one of the most beautiful and skillfully created rug weaving styles known as the Pahlavi Rugs. Pahlavi rugs were created in the 1930s when Reza Shah Pahlavi came to power. Reza Pahlavi implemented a program that elevated the Persian rug industry and redefined the level of excellence expected in Persian-produced rugs. The intention of this program was to achieve the same level of excellence that weaving groups in the 16th and 17th century had achieved. Out of this re-establishment of quality standards, the Pahlavi rug-style was born. The Pahlavi rug style demonstrated intricate weaving and design skill, and this style’s production became widely popular until 1979 when Mohammed Reza Pahlavi was removed from power. The rugs heavily produced by workshops in Tabriz, Nain, Isfahan, Quoom, and Kashan are referred to as Pahlavi rugs because of the influence that the two Pahlavi rulers had on their creation. Technically, the term Pahlavi should only be applied to rugs produced under royal commission; however, this term is frequently used to describe any rug that was produced during this era and resembles the Pahlavi style. Persian rugs are incredibly popular with beautiful styles that can compliment any living space. Persian rug styles are so well-known and loved that most Oriental carpets produced today are based on Persian designs. What Are Oriental Rugs Made Of?